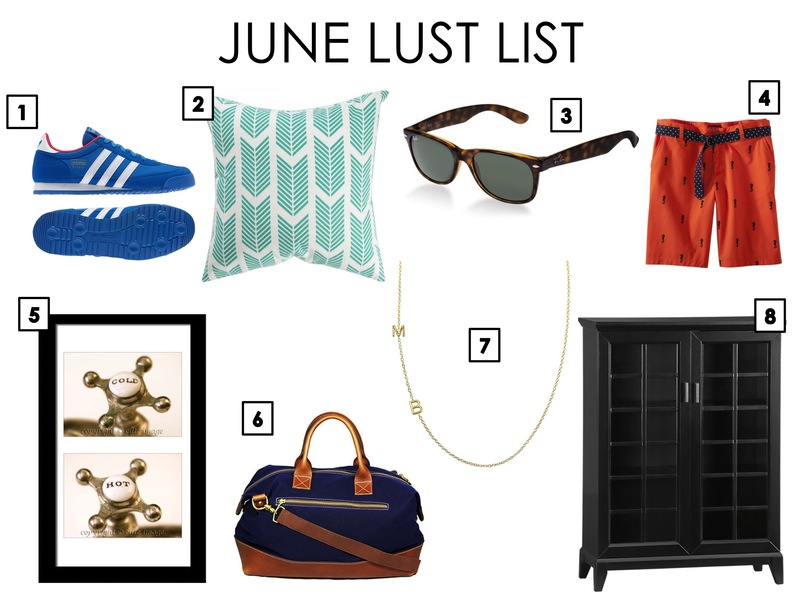 As we’re more than half way through June, I figured it was time to share with you this month’s lust list! Adidas Dragon Shoes: For those that don’t know, Jefe could give Imelda Marcos a run for her money. He’s got great style and LOVES himself a rocking pair of sneakers. As I could use some new casual shoes that aren’t flip-flops (and I’m sure Jefe would be thrilled if I upped my game in the kicks department), I’d love a pair of these in Bluebird. Caitlin Wilson Teal Arrow Pillow: I am loving this new pattern from Caitlin Wilson. Her newest line is bright, happy and perfect for summer. I love this pattern in particular but may go with more of a traditional blue version as an accent for our bedroom. Ray-ban Wayfarers: These will always be a classic. And I could use a pair of sunnies that are both stylish, classic, and don’t get caught in my mess of frizzy hair when I plop them on the top of my head this summer. That East Coast humidity during vacay can be brutal. Merona Relaxed Bermuda Shorts: I love me some New England preppy style, particularly for summer. On a recent trip through Target, I was browsing for a summer dress and came across these in a a fun orange print. And the lobsters had me at hello. They’re already in my closet. Bathroom Faucet Photos: After Jefe picked up this old Gillette print for the bathroom, I decided we needed some matching artwork for the opposite wall. I found these great black & white photos from Etsy. They’re simple, fit the new bathroom style and didn’t break the bank. Ezeiza Weekender Bag: Found this guy on One Kings Lane. It’s just begging to be taken to wine country for the weekend. I love that it is unisex so Jefe or I could grab it for a quick getaway. Asymmetrical Mini Letter Necklace: I’m in desperate need of a new gold necklace. I’m also a sucker for anything monogrammed. Thank you BaubleBar for this little beauty. Kate Spade’s new line Saturday also has a similar, slightly less expensive version. Crate & Barrel Paterson Black Two-Door Cabinet: The credit for this find has to go to Jefe. He got the itch a few months ago to replace our tv stand with a Paterson, which we did. And now that we have this fancy new piece of furniture, we’ve got the itch to keep at the upgrades. We’d love to get this cabinet to replace our old Ikea dresser that we’ve been using as storage in the living room.